There is something peculiar about fashion. Like history it often likes to repeat itself. And every time it makes an appearance, it does so with a lot of fanfare. Retro or vintage fashion is primarily about fashion that is over twenty years old but less than a hundred years. This is a fairly long period for designers to show their talent with the styles. In fact, there are styles that have circled the wheel more than once in this period and have still managed to become globe trendsetters, each time they were brought back. In eyewear too, vintage fashion is back in a big way. Retro look in eyewear made its most recent appearance a season back when the browline, the hit design of the 50s, made a comeback and several eyewear companies manufactured special ranges to showcase their new browline range. There is a stark difference between vintage fashion in clothes and vintage fashion in eyewear. While clothes, décor or lifestyle duplicates styles of yore, retro eyewear can be classified in four distinct categories. The first category is of eyeglass manufacturers- new, old, reputed or young debutants. This group researches on old styles, based on which they launch a new range. The second category comprises of manufacturers who have been making same design spectacles for over 85 years. Basically, what was high fashion at one time is vintage now. The third category is a group of retailers who sell ONS or Old New Stock. These are essentially old spectacles that are sourced from the original manufacturer’s, refurbished and then sold. These are mainly for vintage aficionados who want the antique stuff and not new models of old designs. There is now a fourth category of vintage eyewear dealers, albeit a tiny emerging profile of people dealing with worn old eyewear. They source the eyewear from the seconds market, dismantle, refurbish and assemble it back together. Irrespective of the category, vintage eyewear remains a popular choice with the fashion aficionados. What brands have to offer? Moving on, let’s take a look at the latest in vintage eyewear that is trending across the fashion circuit. Inspired from styles that once ruled the roost, the eyewear in these categories are a beautiful blend of retro designs and modern technology. Chloé has always been known for its subtle style and sheer elegance. So when Chloé decided to seek retro vintage inspiration in its latest design, one naturally expected a restrained style that would reflect the intrinsic qualities of women– grace and femininity. The designs in this collection are essentially inspired from the 70’s era. CE2658 Orme is a style to look out for in this collection. Large rectangular shape, a throwback to another time, stylised in a contemporary manner, are the characteristic elements defining this design. Available in light Havana, black, khaki, plum and honey, the model is highlighted by the iconic Chloé logo placed quietly on the left temple and its unique design. Next come the oversized glasses or round ones, a true tribute to the retro era. The CE117S Eria is one such vintage glass with its round style. Again the contemporary embellishments make all the difference. A startling and lovely contrast is created with the gold metal frame and silver enhancements. 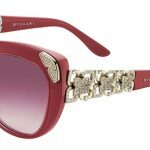 If your heart beats for everything that is vintage, it’s time to go retro in eyewear with Maui Jim’s Kahoma – the recent addition to the sunglass maker’s attractive line of retro-inspired sunglasses. Named after Kahoma Valley on West Maui in Hawaii, the style gives you ample reasons to head out to outdoor lush locations with the comfort and assurance of protected eyes with a classic evergreen eyewear. Kahoma is the land of lush, tropical landscapes, and its namesake sunglass is a modern take on a classic wayfarer design. The sunglasses come in a high grade nylon frame, unique colours, and Maui Jim’s patented PolarizedPlus2 technology. With lens treatments and frames that are saltwater safe, the sunglasses are perfect for driving or relaxing on the beach and add an element of retro glamour to the wearer’s personality. Swarovski’s recent collection also has a lot to offer for the vintage lovers. For instance, femininity and elegance distinguish the refined Fee (SK5128) optical frame, with its large, square shape and contemporary design reminiscent of the bygone era. Its distinctive features provide a contrast in volumes and colours on the metal front, and a shiny decoration along the acetate temples. Precious baguette crystals are arranged in a horizontal row to create a bright graphic motif reflective of the Swarovski world. Vintage inspiration also characterises the feminine Fabiola style. The silhouette is a perfect blend of different materials and volumes: the fine acetate upper profile harmoniously merges into the lightweight metal lower part. The retro look is revisited with a modern flair through contrasting inner profiles in bold, unexpected hues. Bright crystals arranged in a checkerboard pattern on the temples reaffirm the Swarovski signature of the proposal. For those who have been fans of the vintage look, the polka dots is not an alien style. 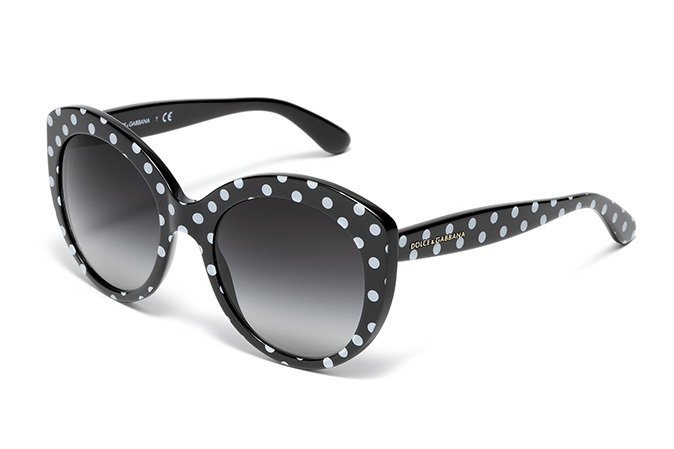 Dolce & Gabbana chooses to immortalise this style with its recent Polka Dots collection. Inspired by the 50’s, these designs consist of oversized lenses with detailed polka dots on the frame that add the retro element to the design. There are impressive frame colours to choose from in the Polka Dots collection. Other impressive options in this category come in the Stripes collection as well as the Colourful Lace collection. The discussion about vintage styles is always incomplete until we pay tribute to the classic aviator designs, isn’t it? Gucci has some excellent options to offer in this category. Inspired by the aviator styles, Gucci offers a line of round frame acetate and metal sunglasses with the classic aviator trims. In addition to the impressive colours to choose from, the designs in this category come with delicate gold metal arms that are tipped with clear acetate for a comfortable fit around the ear. Leading Hollywood celebrities have sported the vintage look as part of their style statement, every now and then. The most recent one being popular music icon Cheryl Cole who was spotted wearing FF0017/S sunglasses, a retro inspired design by Fendi eyewear. The oversized frames coupled with a blend of yellow and black colour on the rims complemented the star’s chic look perfectly. Another popular celeb who opted for a vintage style eyewear in her recent public appearance is leading actress Charlize Theron who stepped out wearing an oversized Salvatore Ferragamo frame. With its metal rims and classic cat-eye shape, these sunglasses convey the retro style statement in a sophisticated manner. In short, vintage eye-glasses recreate a look of a time gone by, adding a subtle hint of sophistication to the style of the wearer. They take the wearer to a time that he or she would most certainly want to relive! Sports Sunglasses: Turn Up Your Game! Go Uber Cool With Recycled Eyewear!